Despite having less-than-spectacular super powers, a group of psiots is being hunted down by a mysterious killing machine and the only one that can protect them is Livewire. The thrilling second chapter of 'Secret Weapons' from Oscar-nominated screenwriter Eric Heisserer (Arrival) and artist Raúl Allén (Wrath of the Eternal Warrior) delves deeper into the lives of these threatened rejects from Toyo Harada’s psiot activation program. Heisserer does a great job of developing the characters using natural dialogue especially between Nikki and Cho who spend the most time together looking for answers as issue two takes on a police procedural-style of sorts. Cho, who can make random things appear out of mid-air never knowing exactly what's coming, is an interesting character. A lot of these "rejects" have come to terms with their passive abilities, Cho shows a vulnerability and insecurity about how his powers actually work. He's still trying to figure it out which in superhero comics is still kind of endearing and refreshing. Things get serious when Rex-O, the relentless Terminator-type, begins tracking down the psiots. It leads to a captivating fight sequence that proves that maybe these rejects aren't as useless or defenseless as they've been labeled. We're introduced to Avi who can turn to stone but can't move while in that state. The scene is a breathtaking piece of choreography and determination from the underdogs. All their hard work pays off as they get a lead as to who is pulling Rex-O's strings. Allen's lines are so clean and precise that every panel is crystal clear. The action flows smoothly and with impact. But where Allen excels most and with great ingenuity is conveying Livewire's accessing the data stream. Part 'Matrix,' part 'Minority Report,' the way Livewire manipulates the information only she can see is pretty impressive. Colorists are usually vital to comics but never more so than for this issue. Martin not only sets the tone for the scenes but envelopes the readers with bright bold colors making the action distinctive and memorable. It's just an awesome looking book. 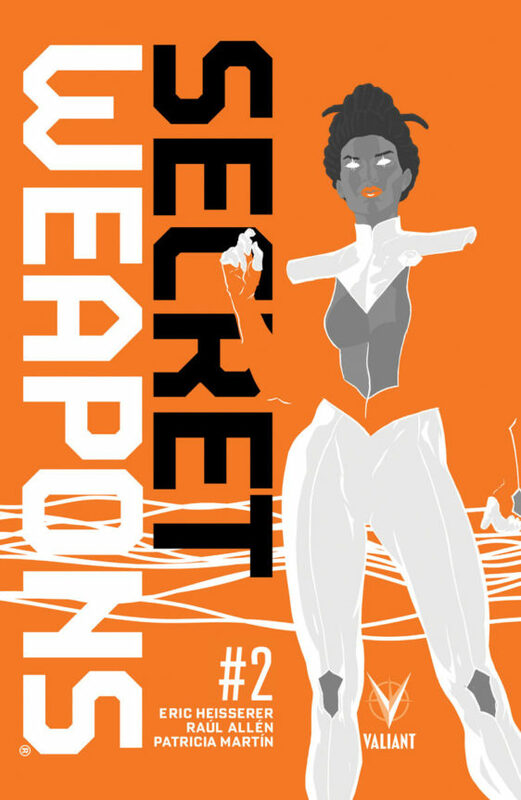 'Secret Weapons' is evolving into one of the most engrossing comics with a unique set of characters. Heisserer is weaving a thrilling mystery within a story of determination and grit. Livewire is a powerful matriarchal figure shielding these rejects and trying to save them from nefarious forces. It's a story you don't want to end with the final page. This is a must-buy.